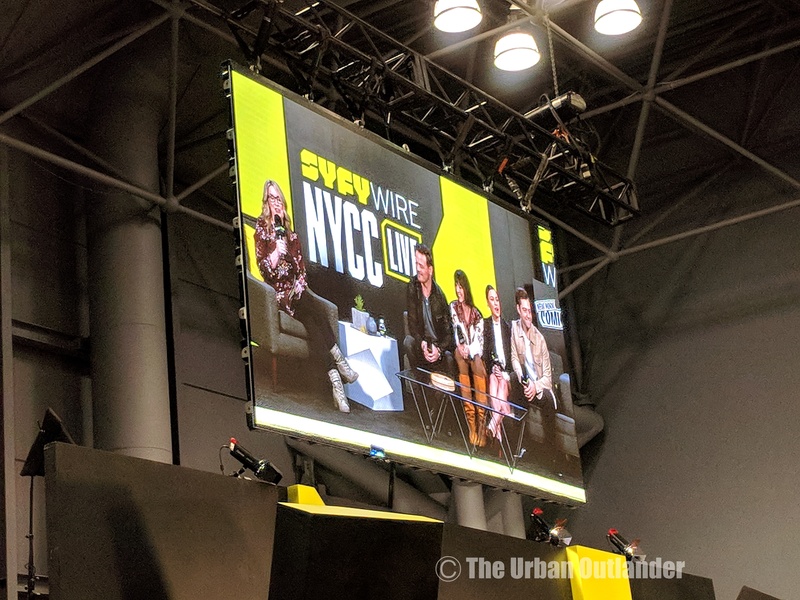 There are many benefits to living in New York City and one of them is when Outlander comes to New York Comic Con! This was the first year they came and thus it was my first time attending the Con as a fan (disregard that one time being dragged to only see the Exhibitors Hall by a geeky boyfriend). 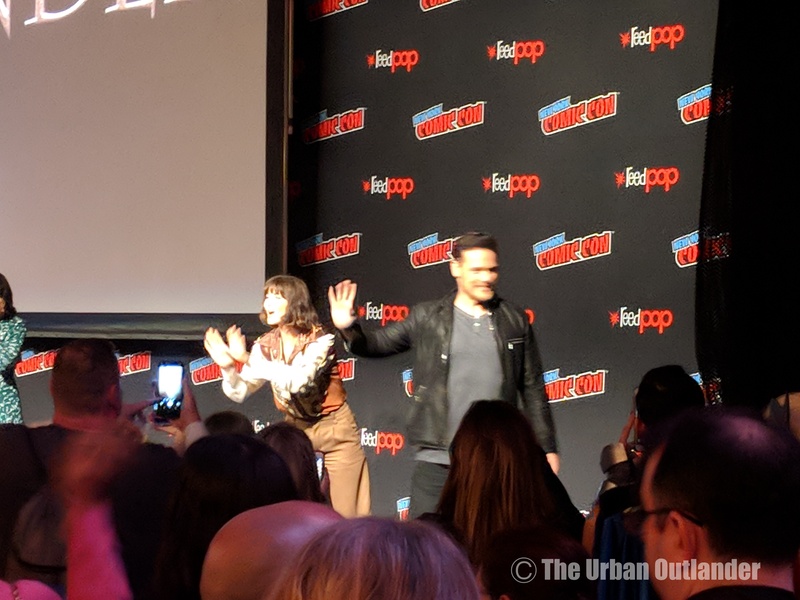 When they announced their appearance I did a happy dance and set my sights on attending. First, getting tickets back in August was agonizing and only now do I realize that I might’ve had a chance to obtain a press pass. Good to know for next time! Sitting on the computer for almost an hour in the online queue to see if maybe I could get tickets was hellish. Yes there are wars in Sudan and Syria, people cowering in fear in blown out buildings, but NYCC makes the online ticketing process one of the worst experiences this side of Western civilization. By the grace of the Con gods I obtained tickets and breathed a sigh of relief. 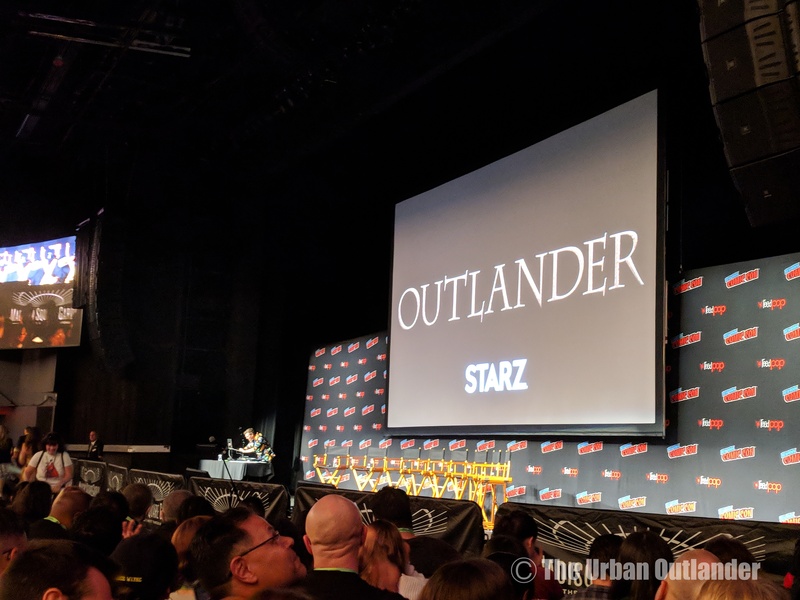 While waiting for October to come, I went to the Outlander New Jersey Con. Waiting in line bright and early. Let’s do this! Finally the week arrived! First, on Friday I went to Executive Producer Ron D. Moore’s panel to hear him speak about the industry and his experience writing and producing television. You can read that here. 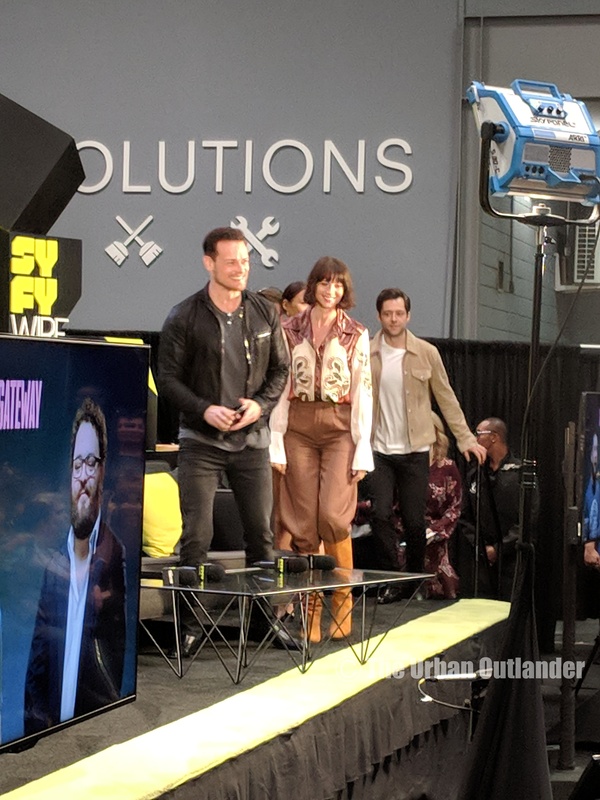 When Saturday morning arrived, I grabbed my tartan plaid, wrapped it around me a là Claire Beauchamp Randall Fraser, and was off to join the hordes of fans! Ellen wore a tricorne that was just lying around her place (of course) and was nice enough to make a tartan rose for me to represent! The NYCC gatekeepers finally let us in…just so we could wait in another line! This time we waited two hours to get into the Starz booth aka”Fraser’s Ridge”. Welcome to Comic Con! Ellen really wanted a donut from the E! food truck next to us but you had to wait in line (noticing a trend here?) to vote for your favorite movie at their kiosk and then be rewarded with a blue glazed donut for your efforts. 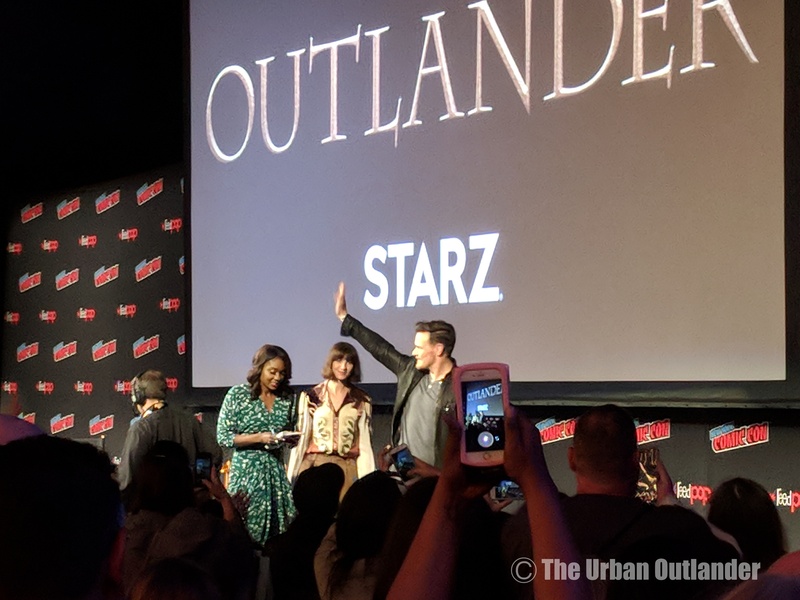 Well I wasn’t going to get out of the line even if she held my spot but she harassed one of the young men working the Starz booth – “I want a donut!” – enough to subdue him into absconding a sweet treat for her. Way to go Ellen. Way to go. They began letting people in at 10am and there must have been a good thirty people ahead of us. The line snaked itself behind the booth and the murmur of chatter was punched with the sudden bursts of joyous screams of people who won a raffle ticket on the other side of the booth. 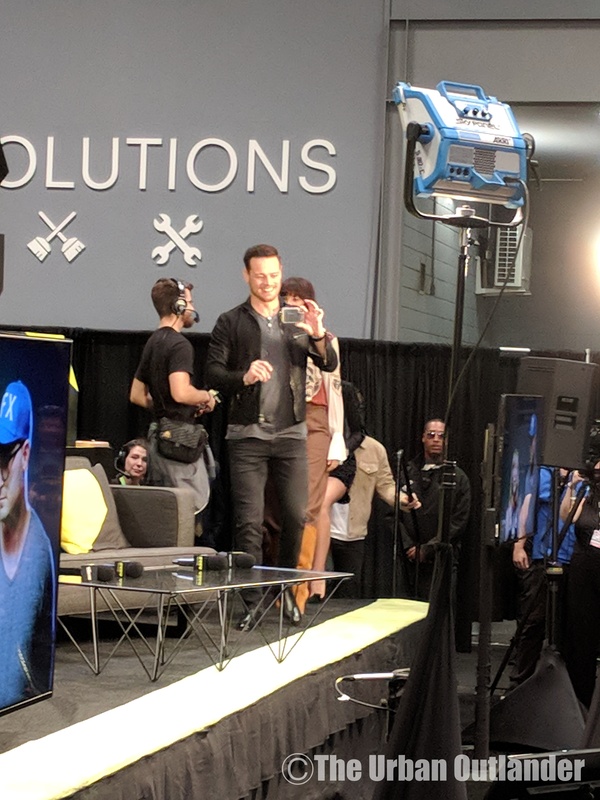 Those screams will haunt my dreams because neither I nor Ellen won a raffle to get autographs and VIP seating at the panel but a friend of ours did. Good for her. We finally made it into the booth! 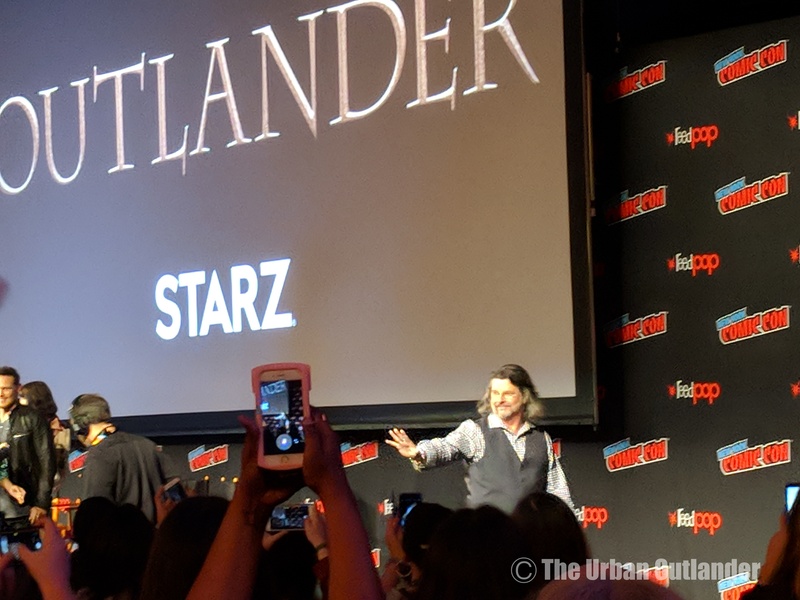 Two days earlier people posted on Twitter the swag you can get and I wanted an Outlander tote in the worst way…and a personalized luggage tag. I wanted it all! They were also giving out some essential oils because let’s face it when you’re out in the woods in the 1700s you gotta smell good. Also while we waited in line to get into the booth they were handing out Entertainment Weekly magazines with Caitriona and Sam on the cover. Thanks Starz! 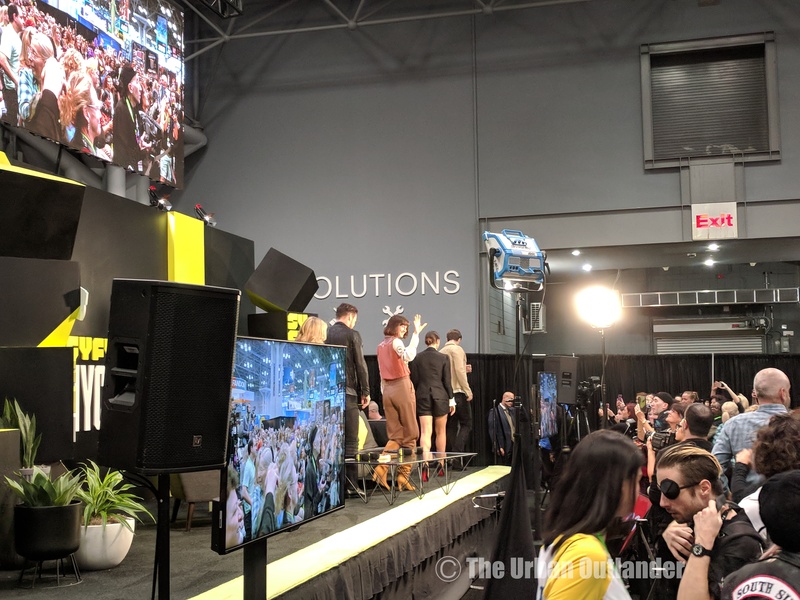 After visiting Fraser’s Ridge and before going to Madison Square Garden to wait in another line for the panel, Ellen and I took a chance to see the cast do a Syfy interview inside the Javits Center. There were so many people there already so we stood to the side and I was able to get some pictures. 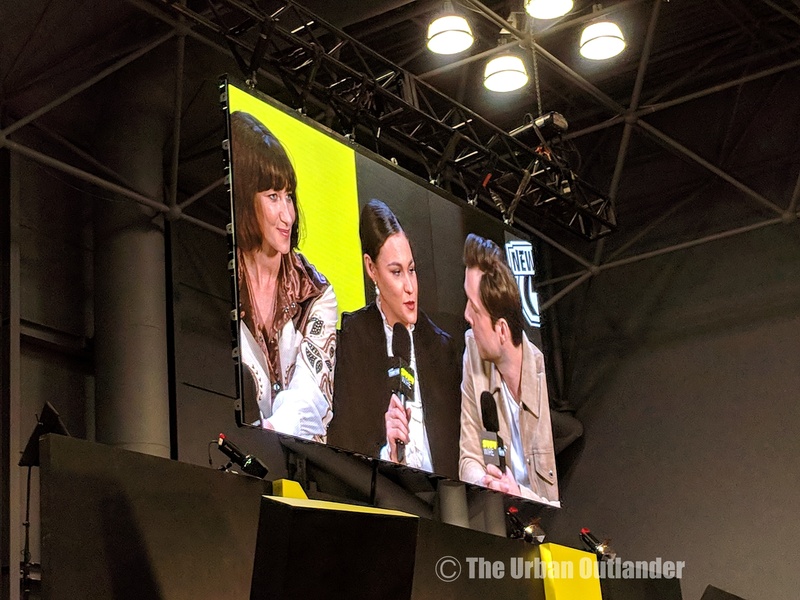 First and foremost, I’m not entirely sure what Caitriona Balfe was wearing but who am I to say? I haven’t graduated from the Fashion Police Academy but I think when you are the star of a television show then nominated for awards standing almost six feet tall with skin that looks brighter than my future living your best life — you can wear whatever the hell you want! 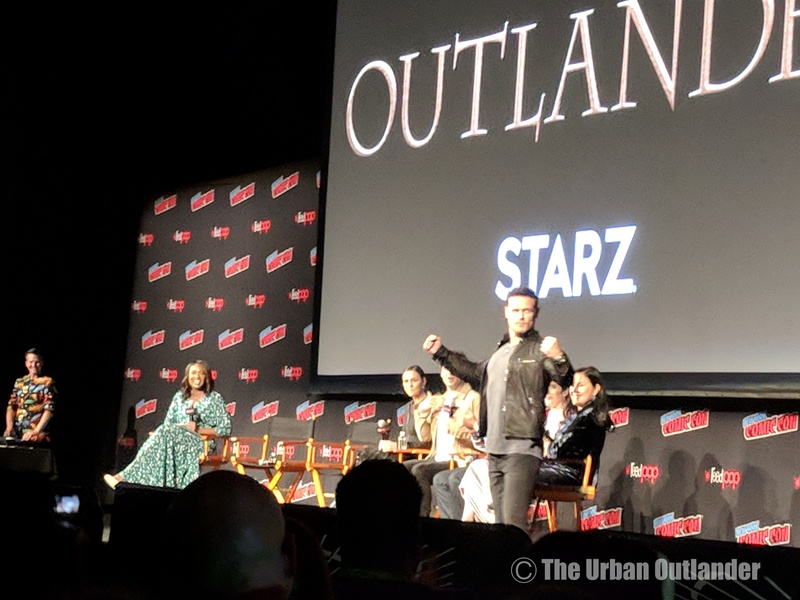 You see the Outlander fans were afraid of The Walking Dead fans taking seats so it was all hands on deck if you wanted to get into the Hulu Theater at MSG before all the undead horde arrived for their panel which was after ours. The tactic was to get in early, claim your seat, sit through some panels that you may not care for, and post-panel you move up closer to the stage as seats emptied. 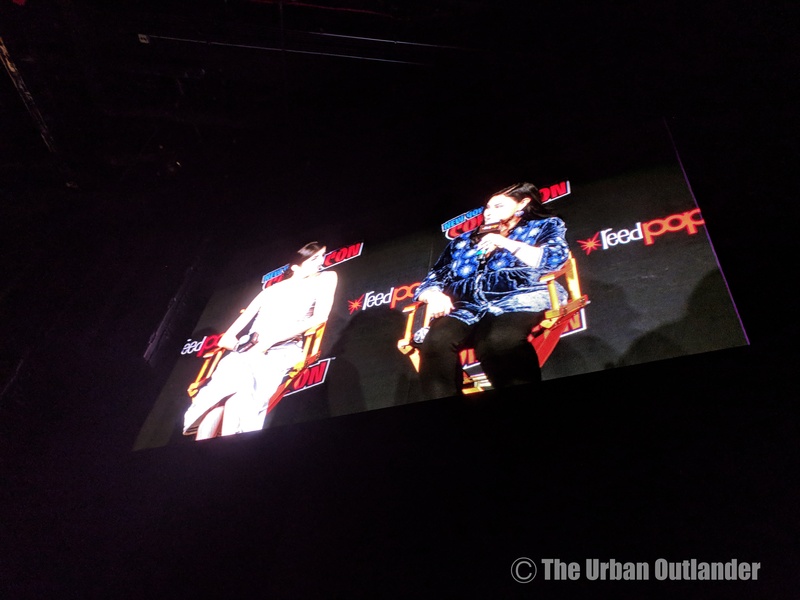 I failed to mention earlier that my mission for attending Comic Con was because I knew in my heart of hearts (and the heart of EP Ron Moore), that they would screen the premiere episode and I needed to be there. 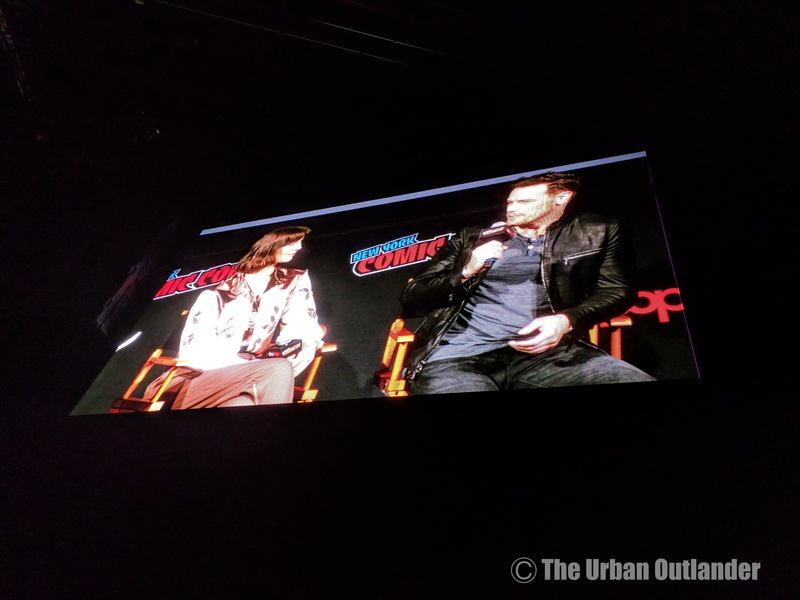 Last year they did the same at San Diego Comic Con and a small part of my heart crinkled because I wasn’t there. 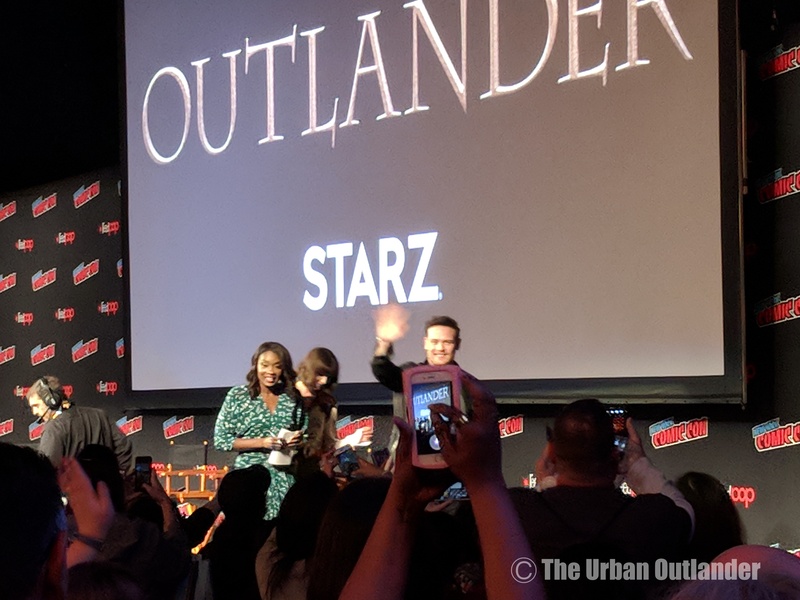 It only made sense to screen it in New York when it was so close to the November 4th air date and it was Comic Con–surprise screenings happen here! I may not have won a raffle ticket but by god I would claw my way over The Walking Dead fans if I had to in order to see the panel and episode. 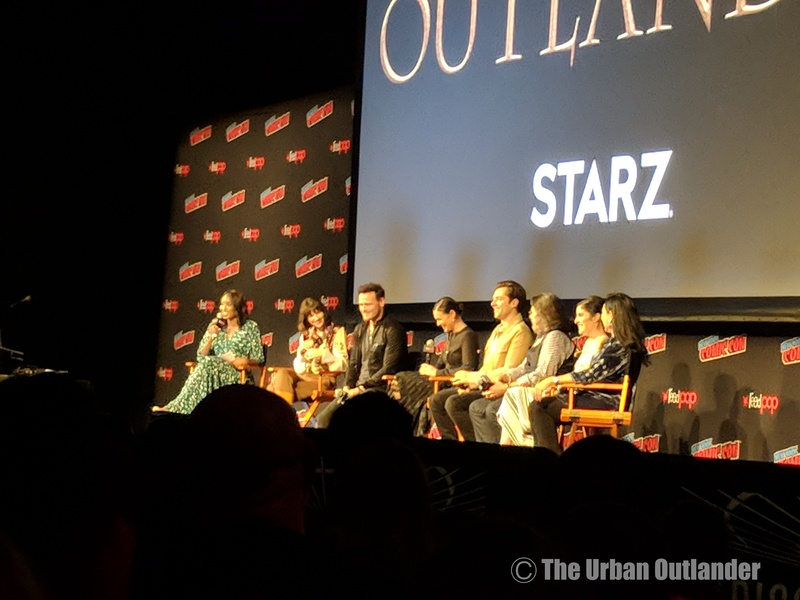 Some people are ok waiting for the episode to air and I’m happy that they have the patience and gratitude to do so but I wanted to be there and see and experience a “first-look”! Basically, I wanted to be one of the cool kids. Well I didn’t have to claw anyone’s eyes out and instead sat patiently through two panels. It was fun to see how “other fans” get excited over Daredevil or the latest iteration of Star Trek. Finally the moment came and guess who walked out? Herself! 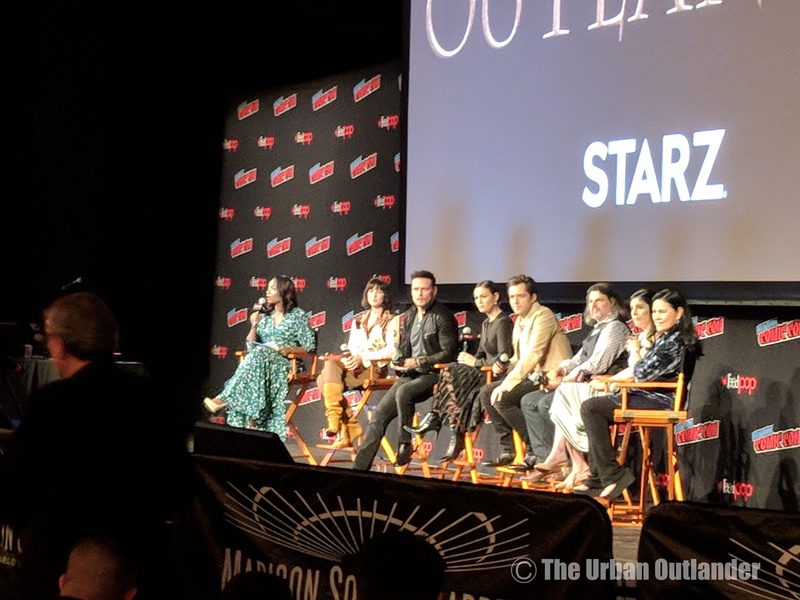 Author Diana Gabaldon introduced the premiere episode screening! We watched the premiere ep of Season Four so VICTORY for me (and all the fans in the audience)! I won’t spoil it but I enjoyed it and need to watch it again (and again) so I can absorb everything. I read “Drums of Autumn” over the summer so the story is still fresh in my mind. At the panel Executive Producer Maril Davis talked about casting First Nations actors from Canada to play the native tribes. Fun fact: Diana’s characters in the book were based on a tribe that doesn’t exist anymore (and barely existed at the time the story takes place) so the writers made them Mohawk for the show! 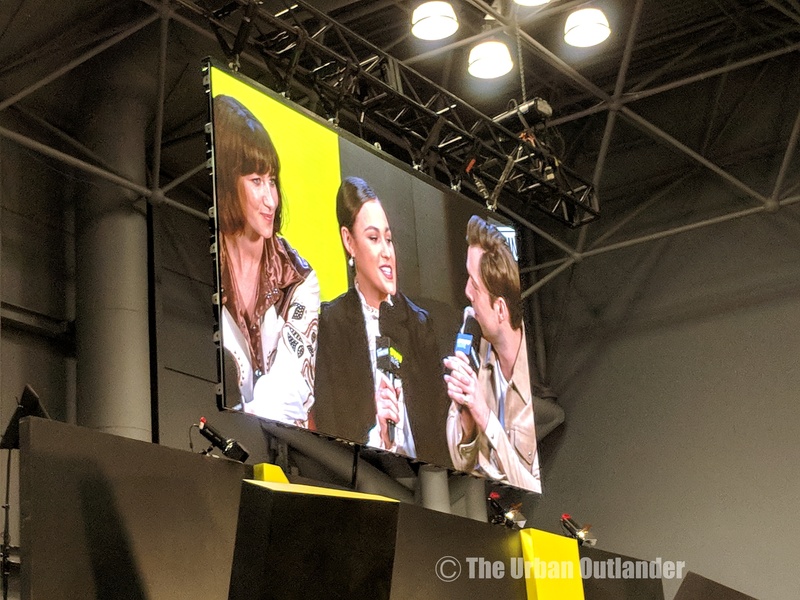 Some fan questions were answered (and not answered) such as “Without giving anything away what were your favorite scenes to film this season?” (Caitriona really enjoyed firing a rifle!) 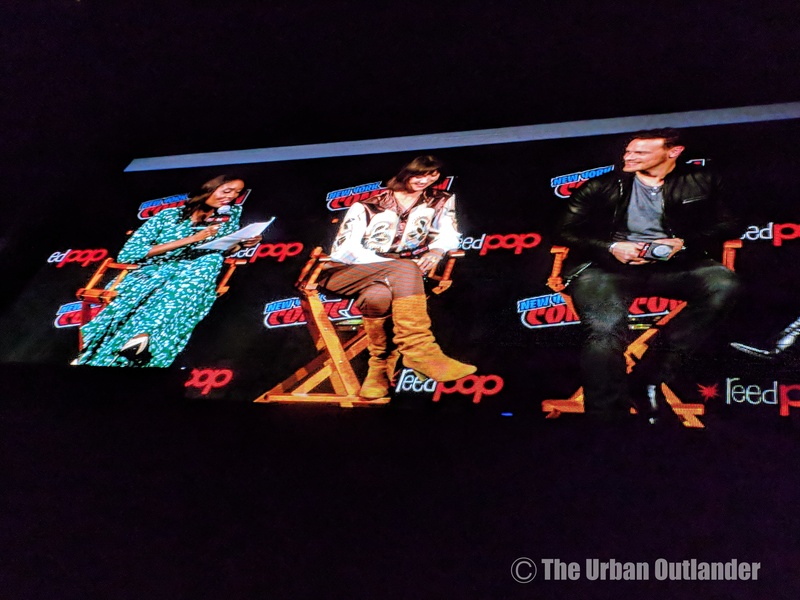 “What were your favorite costumes?” (Caitriona’s was her pioneer woman look). The host Lola Ogunnaika from E! asked who broke scenes by laughing the most and Richard Rankin was nominated by his colleagues for that honor. 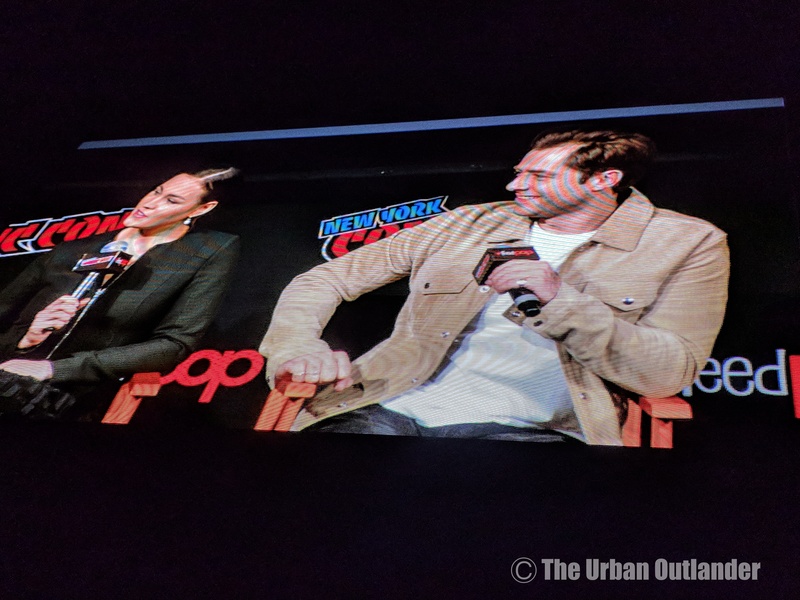 At the last two minutes of the panel, a fan asked about some of the sexual assault that is explored in the series and what opinions the panel had in regards to the #metoo movement and recent events in the nation. Insert awkward hesitation amongst the panel so Host Lola “remixed” the question by asking if any political and social events influence the show’s writers? 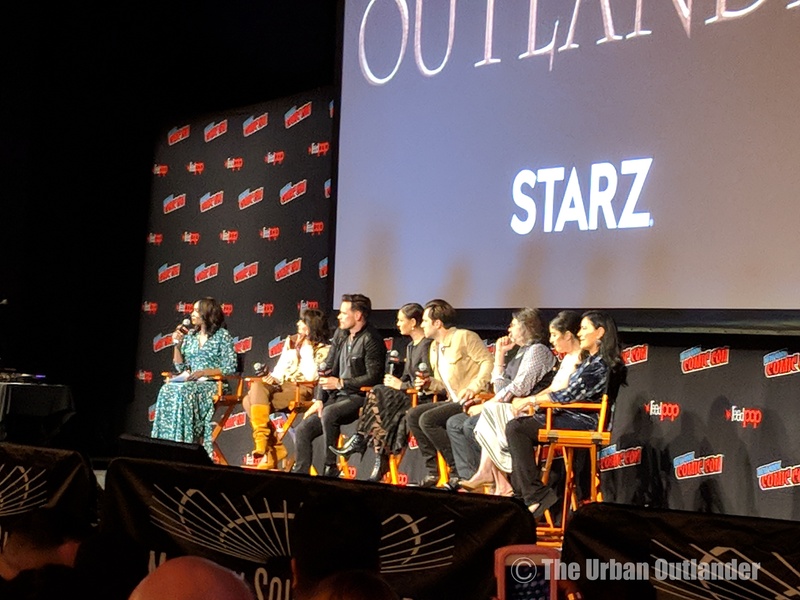 Ron Moore said Outlander is not a political show (in which point some in the audience applauded) but that they basically don’t work in a vacuum and by living in the world it informs what they as writers do. Insert my personal opinion: Yes the show is not a vehicle for commentary on current events in America but I think, for example, the exploration of Jamie’s sexual assault trauma was deftly explored in the show because of current beliefs and experiences that are only now being discussed in public. The panel was fun though short. I wish they could’ve talked more about the season but they couldn’t spoil anything. 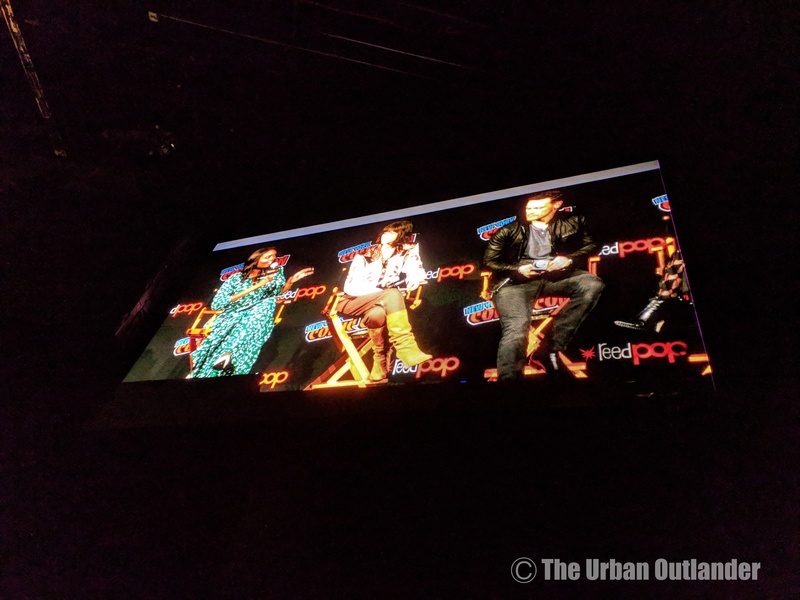 It was fun seeing the cast in person and Diana very proudly presenting the episode and sitting on the panel. 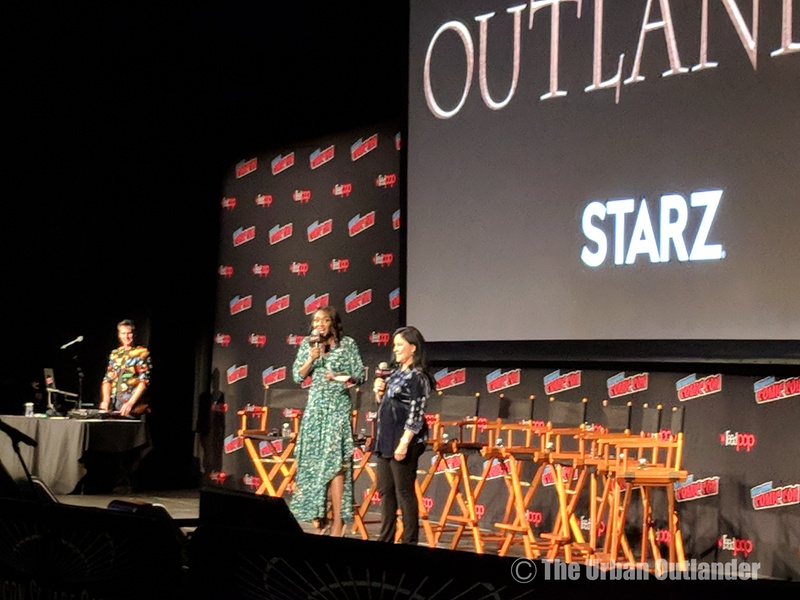 She was going to be at another panel the next day and it seemed she probably guilted Starz into inviting her to NYCC after she passive aggressively tweeted her ire for not being invited a few weeks before. Nevertheless, though I was expecting a screening of the premiere ep, it was great seeing the author make a surprise appearance! 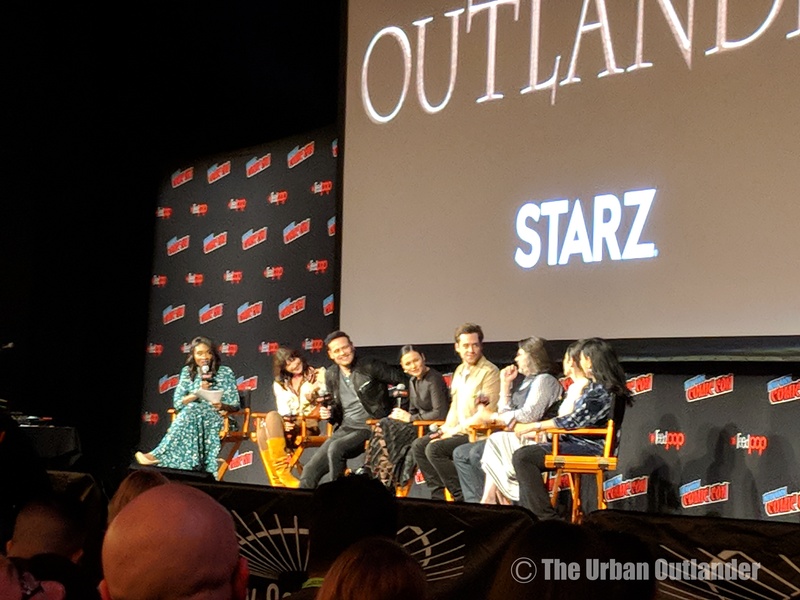 I said to Ellen that I wish they’d do these panels mid way through a season or after it ends to delve deeper into the story but I suppose that defeats the purpose of rallying interest at the top of the season. This is why I’m don’t work in Starz marketing! Ellen and I finished the night with some drinks and food with the Outlander Cast group. Mary and Blake are super nice and sweet. They had some swag for us and appetizers. Conning is hard ya’ll and a drink with some bar food really hit the spot after a long day. Also, Blake’s t-shirt “Just a Frank in a world full of Jamies” was perfect. I salute you sir! 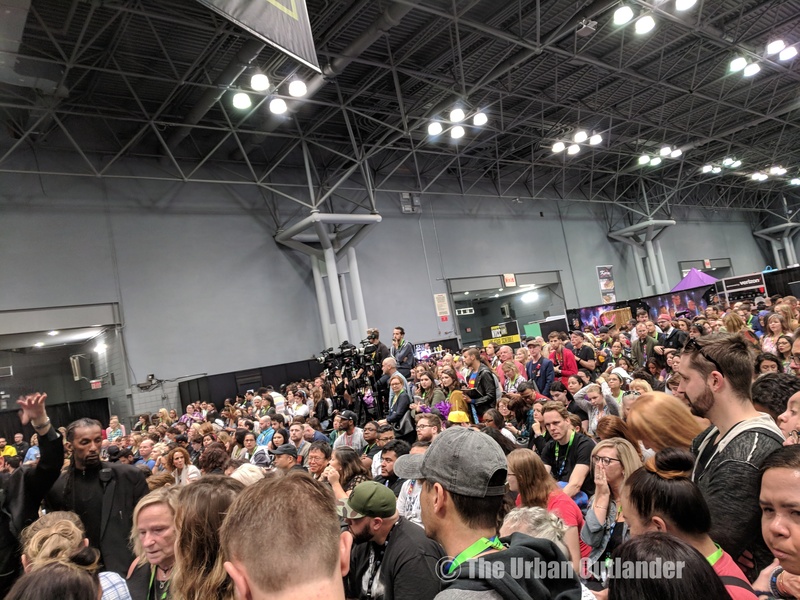 Ladies and gentleman that was the Outlander experience at New York Comic Con! Will I do it again? Only if the show, the cast, and the producers will be there. Also, I’ll be applying for the press pass — my feet hurt and those lines are long!